So, long before quilts were used for art, competitions, bags etc, it turns out that quilts were in fact used on beds to keep people warm. So, in amongst your creative projects, you may decide to have a go at making a quilt to put on a bed. How do you go about doing this crazy idea? Well, first you need to know the size of the bed. 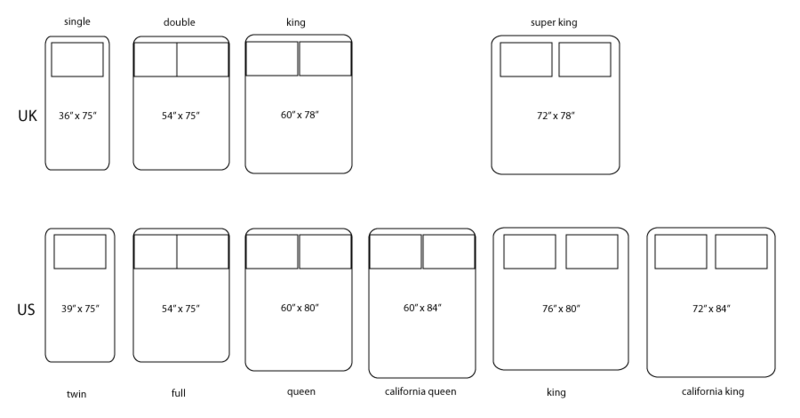 Luckily, in the UK, we only really have 4 different sizes of bed, single, double, king size and super king (American’s have quite a few more varieties!). If the quilt is for your bed, it should be easy to figure out. However, if you’re trying to make a quilt surreptitiously, you may want to use one of the following lines to find out your quilt-receiver’s bed size. "I’ve heard that people who sleep in bigger beds grow taller than those in small beds. How big is your bed?" Follow up with a comment about their size in relation to their bed, whilst mentally recording their bed size. Feel free to add that you think it might be that taller people buy bigger beds – it’ll impress them. "I’ve heard that double beds are the most popular size of bed and divans are the most popular bed type. What size and type of bed do you sleep in?" Asking for their bed type last will distract them from the question about size. If they buck the trend, comment on how they’re special; if they follow the trend, make a comment about how they are such a trend setter. Flattery will get you anywhere. "Did you know that if two people share a double bed they only have 27 inches of room each. That’s a whole 9 inches less than if you slept in a single! Do you sleep in a double or single bed?" Even though you’ve only given them two options, they are bound to tell you if they sleep in a king or super size. If they do, tell them that you’re impressed with their wise decision. If they sleep in a double (with someone else) offer sympathy. Next to consider is whether you want the quilt to overhang. If the bed is a bunk, or next to a wall, you may want the quilt to just sit on top. If you do want some overhang, decide if you want it the quilt to hang over the sides of the mattress, all the way to the floor, or somewhere in between. There’s no such thing as a standard mattress size – some mattresses are 8–10" thick, but some extra thick ones may be as high as 16–20". Then, consider whether you want to add a pillow tuck, so that part of the quilt can be tucked under the pillows then back over them? Once you’ve decided all this, design your quilt, buy your fabric, sew it together and there you have a perfectly sized quilt for a bed. I have a question regarding my bed size (54″ x 75″) Vs. the Bolts widths. How can you cover all your bed in width 54″ + 16″ of the mattress size + 10″ to tuck under the mattress. 54+16+10=80″ inches of fabric, but the bolts only comes in 44 inches width. Can you clarify this to me?